Epididymis - Spermatocele. 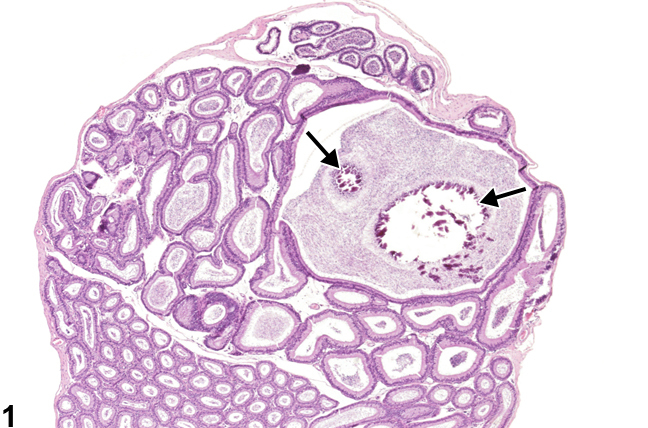 A sperm-filled dilated duct in the head of the epididymis, with focal areas of mineralization (arrows), in a male B6C3F1 mouse from a subchronic study. Spermatoceles are cystic dilations of the epididymal duct (three or more times the diameter of the normal duct), which may be lined by hypertrophic or normal epithelium. They are most commonly seen in the initial segment or the caput region of the mouse epididymis (Figure 1) and are filled with varying amounts of sperm. 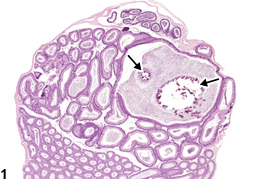 Focal areas of mineralization are present within this spermatocele (arrows, Figure 1 ). Spermatoceles generally occur as background, incidental lesions but have been reported in association with exposure to some chemicals. They are distinguished from sperm granuloma by the absence of an inflammatory response. Spermatoceles should be recorded as present and discussed in the pathology narrative if the incidence appears to be related to chemical administration. If present in both epididymides, the diagnosis should be qualified as bilateral. It is not necessary to grade spermatoceles. Cooper ERA, Jackson H. 1973. Chemically induced sperm retention cysts in the rat. J Reprod Fertil 34:445-449.